THE PERFECT QUICKIE! This tour is perfect for those who wish to discover the city through its historic and cultural heritage. Visitors always fall in love with the old districts such as Graça and Alfama and so will you! BESTSELLER! 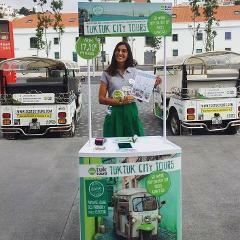 The Tram 28 is the most famous public tour in Lisbon, it’s a kind of journey through time and that’s why we’ll comfortably “follow it” aboard our Eco Tuk, quietly and with zero carbon emissions. Our eco tuks will take you on a trip that will highlight a selection of magnificent monuments and stories that are a MUST if you really are in the mood for the Discoveries. 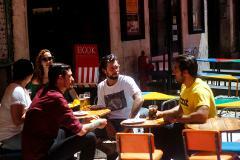 The tour will start in Lisbon downtown with Belém as destination. THE BEST VIEWS! Welcome to the romantic tour for the sunset lovers! In a city of 7 hills here is something that you can’t miss: panoramic views and viewpoints, places where the most important thing is that you're touching the sky! FOOD TOUR| This is the best tour to introduce to you what we eat, how and where we do it in this wonderful city. You’ll discover the most charismatic areas such as Graça, Alfama and Baixa with different tasting experiences included! ALL TOURS IN 1! This is our best-selling tour! 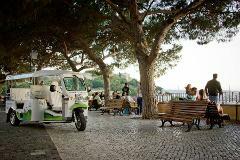 In 5 hours you can visit the most important landmarks of Lisbon aboard a Tuk-Tuk guided by a local Storyteller. Our drivers have a natural vocation to tell stories and make people feel at home. DO IT YOUR WAY 1H! As soon as you’re comfortably installed in our eco-friendly vehicle, your tailormade journey begins. We want you to see as many beautiful and significant locations as possible within 1 hour! DO IT YOUR WAY 2H! As soon as you’re comfortably installed in our eco-friendly vehicle, your tailormade journey begins. We want you to see as many beautiful and significant locations as possible within 2 hours! DO IT YOUR WAY 3H! As soon as you’re comfortably installed in our eco-friendly vehicle, your tailormade journey begins. We want you to see as many beautiful and significant locations as possible within 3 hours! Let’s do it your way! As soon as you’re comfortably installed in our eco-friendly vehicle, your tailormade journey begins. We want you to see as many beautiful and significant locations as possible within 4 hours! This is the best tour to introduce to you what we eat, how and where we do it in this wonderful cit,y with exclusive pick up at the Cruise Terminal. 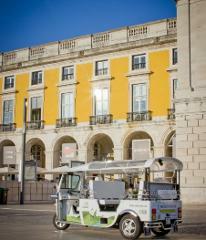 Eco Tuk Tours Lisbon is the official partner of the Cruise Terminal.